These trips are ALWAYS a sell out and ALWAYS fun! Guest’s will be dropped off at Bryant Park at approx 10:30 am for a day of shopping on own! 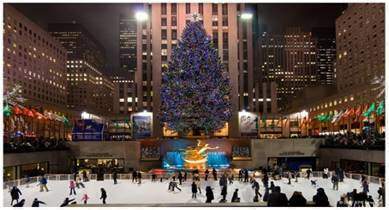 Bryant Park is centrally located to Rockefeller Center, Times Square, Macy’s and many, many more places to shop, dine and explore while the city is decorated for the holidays! We will pick up at Bryant Park at approx 5:30 pm for our return home. As always we will make a comfort rest stop into the city and out of the city. For both the Turkey Train on 10/28 and the trip to new York 12/8 , I cannot finish registration. Can I stop by with the deposit for both and leave it at the office? I realize payment for train is due on the 27th. Hello Lisa, Thank you for your interest in attending Foxy Travel Motorocoach Tours. To register with a card, it is payment in full only with a servie fee of $2.50 applied. We accept deposits by Cash or Check only and the trip would then need to be paid off by that form of cash or check by final payment due dates. Please note a space is not reserved until payment has been recieved. We are open Monday – Friday 9:00 am – 5:00 pm and Saturdays 9:00 am – 12:00 pm, to register in person. Thank you!